I love a good quiz, and am always interested in goddess archetypes - I believe the ones we connect to can tell us much about ourselves. so, before I explore what 5 different "What Goddess archetype are you" quizzes in the name of research. I'll first tell you what I am expecting: I am an earthy sort of goddess, in Ayurvedic medicine my dosha is full-on Kapha (which is connected to earth and air elements) which basically means I'm prone to laziness and sluggishness due to my strong connection with the earth, and I can be a bit slow (I always think of a better answer to a question 5 minutes after I've been asked it!) my spirit animal is a dragon, slow, lumbering, but strong firebreather when needed! So I'm expecting Gaia, Haumea, Terra, (Earth goddesses) possibly Hestia (goddess of hearth and home) or autumnal goddess Bambha Goddess of the harvest, stone circles and shelter from the darkening days (I love nesting in autumn). So that's the expectation before I've taken the quizzes.... let's take some quizzes and see what they have to say! 1) Tantric Alchemy presents 5 different archetypes. According to this quiz I embody is Goddess Saraswati - Saraswati is the Goddess who flows with creative language, speech and sound. She helps us connect to deeper spiritual truths & awaken to the magic of every moment. She helps us to awaken to our creativity, self-expression & our intuitive knowings. With some further research I also found that Saraswati is the goddess of nature as well. In Welsh legend, Cerridwen represents the crone, which is the darker aspect of the goddess. She has powers of prophecy and is the keeper of the cauldron of knowledge and inspiration in the Underworld. She is the Goddess of Transformation, Surrender, Inspiration and Renewal. Known as Dark Mother’ becasue of her great kindness to be found in this world we may sleep, rest, dream and heal, rising more determined each cycle into Her great light, ready to serve all existences when the time is right. Her message is one of compassionate caring love for All and complete empathy. Her arrival announces change, and time of spiritual healing. This is interesting as I have been to new moon ceremonies with the priestesses of Cerridwen and Glastonbury Goddess Temple - and very much enjoyed the energy of renewal and transformation of Cerridwen - I'm not sure I embody that, but certainly enjoy the process of exploring transformation. 3) Finding your inner Goddess Yay! I got Hestia: goddess of the hearth, home, peace, tranquillity, quiet, contemplation, inward-looking, sanctuary and intuition. I love a peaceful time at home and making my home welcoming and warm. And time to both welcome people into my home, and to enjoy it in my own company. 4) Who is your patroness Goddess? I got Selene: Greek Goddess of the moon. Because the moon always changes, She will help you to cope with change. The website notes that "If you've been taking note of moon phases, like to watch the moon, and like to be outside during full moons, Selene is probably your patron" Which makes a lot of sense with my love of running yearly moon retreats! 5) Finding your Goddess Element really more of an article than a quiz, but nice simple guide and I of course, aligned with Gaia, Earth Mother, creation Goddess. (Earth) "You are in your element when you can connect to your intuition, exploring dreams and contemplating the deeper meaning of life" but I also liked "You share a love for spirituality like Goddess Selene, the Greek goddess drawn to the Moon and heavens"
So why is this interesting/useful? The goddess archetype embodies the divine feminine. Some women wholeheartedly identify themselves as a goddess. Other women shy away from mere mention of the idea. Given the sheer volume of different goddesses around the world, there are more than enough to match everyone. The thing to do is to start with one goddess you most identify with. Creating a list of the qualities of the goddess archetype that you value most will also help you in your selection process. Sit in contemplation and write a definition of what the goddess means to you. Which of the qualities of sexuality, beauty, love, nurturance, protection, fertility, mystery, or darkness stand out? Now search for a goddess that embodies those qualities. Also consider the context that each goddess is in. Often a goddess is associated with a specific season like spring or summer, and this season will be one that speaks to you most. Some goddesses are associated with the moon or nighttime, while others with the sun and daytime. The story of the goddess’s life may also strike a cord and be similar to your own in some way. An immensely revealing aspect of working with the goddess archetype is that she is a container for countless other archetypes. For example, the goddess Hestia contains the hermit and the homemaker. Athena contains the warrior, artist, guide and mentor. 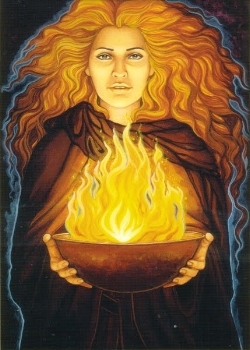 The Celtic goddess Brigid expresses the poet, healer, and artist. Once you familiarize yourself with the mythology and symbolism of a particular goddess, As you can see, a whole world opens us below the surface. It is fascinating work that can go on for a lifetime. GODDESS ARCHETYPES ARE THE INNER PATTERNS OF A WOMAN’S PSYCHE. They represent the instinct, interest, aspiration, personality traits and behavioural pattern within us. We find goddesses in ancient mythologies, yet many of their images are still vividly embedded in our modern society. For instance, the image of Aphrodite is often associated with love and beauty, while Athena is linked to wisdom and craft. Their symbols transcend time, as we can draw ancient wisdom from mythologies and apply them with modern feminine psychological perspectives. THERE ARE GODDESSES WITHIN EVERY WOMAN. When you suppress your archetypes (your true self) you can experience inner conflicts that can create roadblocks in developing and expressing your deepest potentials, which will limits your personal growth. By becoming aware of the active goddess archetypes in you, you will have a better understanding of who you are and who you want to become. You will gain insights to your unconscious mind and why you show up in the world the way you do. You will be more aware of your “goddess-given” gifts and talents.